Can you tell it’s October? One clue is that every time the market stubs its toe, as it did late last week, headlines immediately scream “Gangrene!” and warn of the need to amputate at the hip. 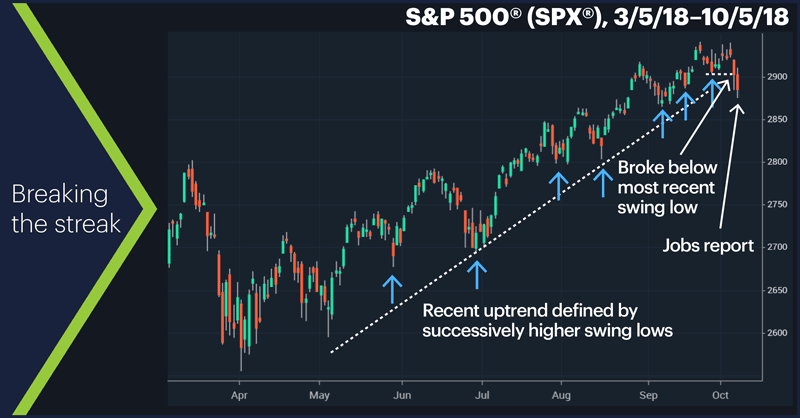 What started out looking like a potentially bullish week—an up Monday (including a new Nasdaq 100 record high) amid a revamped NAFTA deal—soured fairly quickly as climbing Treasury yields, slumping small caps, and China trade fears appeared to weigh on market sentiment. All told, it wasn’t too bad of a hit for the broad market: a roughly 1% decline in the S&P 500 (SPX), although it was the second-straight weekly loss, and was accompanied by a more attention-grabbing 4% drop by the Russell 2000 (RUT) as small caps continued to retreat from their August highs. Also, the SPX broke its streak of higher swing lows extending back to May that had prevailed during the recent uptrend. 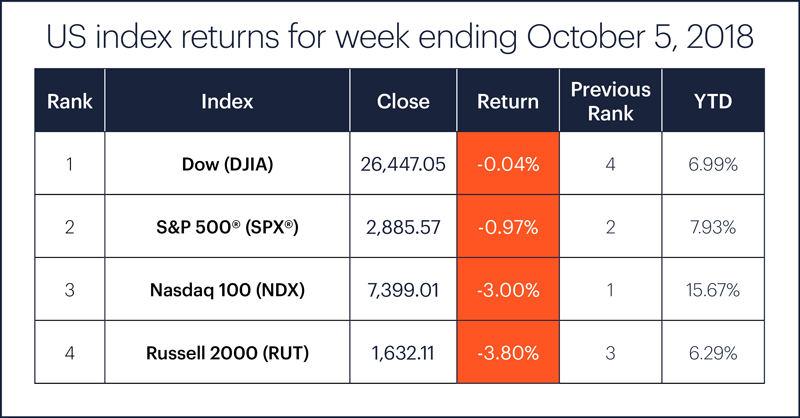 Although the Dow Jones Industrial Average (DJIA) banged out a couple of new record highs on Tuesday and Wednesday (trading to within 50 points of 27,000), bearish sentiment appeared to gain the upper hand by Thursday. Treasury yields, which had spiked on Wednesday to 3.15%—above the level they were at in May when the stock market got the willies about them—edged higher on Thursday and Friday to their highest level (3.23%) since 2011. Traders took the SPX 1.4% lower intraday, although the index recovered to close down less than 1%. The market followed through with a similar intraday decline on Friday, but again rallied off its lows to trim its closing loss. And those who may have expected a little more enthusiasm for Friday’s jobs report—which showed unemployment at a 49-year low of 3.7%—need only have looked past the headline to the smaller-than-expected number of new jobs and weak wage growth. Sector action: The top-performing S&P 500 sectors last week were utilities (+1.9%, grabbing a tie for the top spot with a Friday surge), energy (+1.9%), and financials (+1.5%). The worst-performing sectors were consumer discretionary (-4.7%), real estate (-2.7%), and communications services (-2.2%, the revamped telecom services sector). Highlight reel: Tesla (TSLA) jumped more than 17% last Monday after news broke that CEO Elon Musk and the Securities and Exchange Commission (SEC) had reached an agreement that would result in Musk stepping down from the board and paying a $20 million fine, but remaining as CEO.2 Four days later, though, the stock had given it all back, closing near a one-month low. Data management firms Cloudera (CLDR) and Hortonworks (HDP) both jumped around 18% intraday on Thursday on news of their merger before settling for 12% closing gains. The steady stream of weak housing numbers took its toll on many homebuilder stocks (see “Checking the foundation”), including LGI homes (LGIH), which broke below support to start last week and traded lower every day but Friday, including a 10% drop on Thursday. Futures action: November WTI crude oil (CLX8) nearly tagged $77/barrel on Wednesday—a nearly four-year high—before pulling back below $75 on Thursday. Moving inversely to rising Treasury yields, December 10-year T-note futures (ZNZ8) dropped around 1% on the week, closing Friday at a new contract low of 117.62. Gold seemed to answer last week’s question—was the September 27 down move a breakdown or a bear trap?—by rallying back toward the high of its trading range last Tuesday. But the market pretty much sat on its hands the remainder of the week, with December gold futures (GCZ8) closing around $1,207/ounce—smack-dab in the middle of their trading range. Go to the E*TRADE market calendar (logon required) for an up-to-date schedule, along with a complete list of splits, dividends, IPOs, economic reports, and other market events. Role reversal. The Dow, which lagged the other US indexes for most of this year, has moved out of the basement apartment and handed the key to the RUT. The Russell has surrendered more than half of its 13.17% year-to-date return as of August 31, and now trails the Dow by almost a percentage point in that department. 1 Bloomberg.com. The Big Hack: How China Used a Tiny Chip to Infiltrate U.S. Companies. 10/4/18. 2 TechCrunch. Elon Musk agrees to resign as Tesla chairman in settlement with SEC. 9/29/18.